This stunning space wallpaper is a NASA Hubble Space Telescope image of Comet C/2012 S1 (ISON) when the comet was slightly closer than Jupiter's orbit at a distance of 386 million miles (621 million km) from the sun. The odds are pretty good that Comet ISON will survive its much-anticipated close solar approach next month, a new study suggests. As long as ISON is a fairly typical comet — one with "normal" size, density and rotational characteristics — it probably won't disintegrate during its upcoming flyby, which will bring the icy wanderer within just 730,000 miles (1.2 million kilometers) of the sun's surface on Nov. 28, researchers report. In the new study, Matthew Knight of the Lowell Observatory in Flagstaff, Ariz., and Kevin Walsh of the Southwest Research Institute in San Antonio conducted simulations of Comet ISON's upcoming solar approach, then put the results in context by looking at how other "sungrazing" comets have performed during their encounters with our star. The possible outcomes for Comet ISON are total disintegration; initial survival with a breakup coming later, perhaps days or weeks after the Nov. 28 flyby; and full survival for another orbit around the sun. Which one of these will actually occur depends on ISON's size and density, as well as the nature of its rotation (how fast it's spinning, and in which direction), researchers said. Comets less than about 0.12 miles wide (0.2 kilometers) face destruction by the sun's heat, which can evaporate off all of their ices. But scientists think ISON is big enough to deal with this issue; most estimates place the comet's core between 0.12 miles and 1.2 miles across (0.2 to 2 km). Another threat comes from the immense gravitational pull of the sun, which can tear apart comets that are unusually light and fluffy. But as long as ISON is of roughly average density, it should be able to hold together, researchers said. None of this is set in stone, of course, since most of the key characteristics — including Comet ISON's exact size, density and spin — remain unknown. And it's notoriously difficult to predict the behavior of comets, especially "dynamically new" ones like ISON making their first trip to the inner solar system from the distant, frigid Oort Cloud. 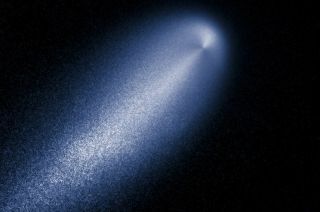 "Whether or not disruption occurs, the largest remnant must be big enough to survive subsequent mass loss due to evaporation for Comet ISON to remain a viable comet well after perihelion," Knight said in a statement. Researchers used NASA's Hubble Space Telescope to measure the rotational pole of ISON's core and determined that only one side of the comet is being heated thus far as it streaks toward the sun. But that should change on or around Nov. 21, when Comet ISON ducks inside the orbit of Mercury, the solar system's innermost planet, team members said. "Since the surface on the dark side of the comet should still retain a large fraction of very volatile materials, the sudden exposure to the strong sunlight when it gets closer to the sun than Mercury could trigger huge outbursts of material," study leader Jian-Yang Li, of the Planetary Science Institute in Tucson, Ariz., said in a statement. Both studies were presented today (Oct. 9) at the American Astronomical Society's Division for Planetary Sciences 45th annual meeting in Denver.